De Quervain syndrome (French pronunciation:also known as washerwoman's sprain, Radial styloid tenosynovitis, de Quervain disease, de Quervain's tenosynovitis,de Quervain's stenosing tenosynovitis or mother's wrist), is a tendinosis of the sheath or tunnel that surrounds two tendons that control movement of the thumb. The two tendons concerned are the tendons of the extensor pollicis brevis and abductor pollicis longus muscles. These two muscles, which run side by side, have almost the same function: the movement of the thumb away from the hand in the plane of the hand—so called radial abduction (as opposed to movement of the thumb away from the hand, out of the plane of the hand (palmar abduction)). 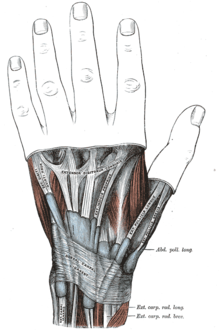 The tendons run, as do all of the tendons passing the wrist, in synovial sheaths, which contain them and allow them to exercise their function whatever the position of the wrist. Evaluation of histological specimens shows a thickening and myxoid degeneration consistent with a chronic degenerative process. The pathology is identical in de Quervain seen in new mothers. De Quervain is potentially more common in women; the speculative rationale for this is that women have a greater styloid process angle of the radius. The cause of de Quervain's disease is not known. In medical terms, it remains idiopathic. Some claim that this diagnosis should be included among overuse injuries and that repetitive movements of the thumb are a contributing factor, but there are no scientific data that support a link between hand use and de Quervain's. A common speculative cause or association today is typing on handheld devices, which has led to the condition being dubbed "Blackberry Thumb". Symptoms are pain, tenderness, and swelling over the thumb side of the wrist, and difficulty gripping. Finkelstein's test is used to diagnose de Quervain syndrome in people who have wrist pain. To perform the test, the examining physician grasps the thumb and the hand is ulnar deviated sharply, as shown in the image. If sharp pain occurs along the distal radius (top of forearm, about an in inch below the wrist; see image), DeQuervain's syndrome is likely. Your doctor may also recommend injections of corticosteroid medications into the tendon sheath to reduce swelling. Treatment is generally successful if begun early on, though the pain may recur if you continue the repetitive motions that aggravate your condition. Your medical care may include a visit with a physical therapist or occupational therapist, who may review your habits and give suggestions on how to make necessary adjustments to relieve stress on your wrists. Your therapist can also teach you exercises focused on your wrist, hand and arm to strengthen your muscles, reduce pain and limit the irritation of the tendons. The therapist may also make a splint to immobilize your wrist and thumb if off-the-shelf versions don't fit you well. ^ Ilyas A, Ast M, Schaffer AA, Thoder J (2007). "De quervain tenosynovitis of the wrist". J Am Acad Orthop Surg 15 (12): 757–64. PMID 18063716. ^ Ahuja NK, Chung KC (2004). "Fritz de Quervain, MD (1868-1940): stenosing tendovaginitis at the radial styloid process". J Hand Surg [Am] 29 (6): 1164–70. doi:10.1016/j.jhsa.2004.05.019.PMID 15576233. ^ Clarke MT, Lyall HA, Grant JW, Matthewson MH (December 1998). "The histopathology of de Quervain's disease". J Hand Surg [Br] 23 (6): 732–4. PMID 9888670. ^ Read HS, Hooper G, Davie R (February 2000). "Histological appearances in post-partum de Quervain's disease". J Hand Surg [Br] 25 (1): 70–2. doi:10.1054/jhsb.1999.0308.PMID 10763729. ^ Mayo Clinic. "De Quervain's tenosynovitis:Tests and diagnosis". ^ Mayo Clinic. "Arm pain: Causes". ^ a b Christie BG. Local hydrocortisone in de Quervain's disease. Br Med J 1955 Jun 25;1(4929):1501–3. ^ Piver JD, Raney RB. De Quervain's tendovaginitis. Am J Surg 1952 Mar;83(5):691–4. ^ Lamphier TA, Long NG, Dennehy T. De Quervain's disease: an analysis of 52 cases. Ann Surg 1953 Dec;138(6):832–41. ^ McKenzie JM. Conservative treatment of de Quervain's disease. Br Med J 1972 Dec 16;4(5841):659–60. ^ Corticosteroid injection for treatment of de Quervain's tenosynovitis: a pooled quantitative literature evaluation. J Am Board Fam Pract 2003 Mar-Apr;16(2):102–6. ^ Witt J, Pess G, Gelberman RH. Treatment of de Quervain tenosynovitis. A prospective study of the results of injection of steroids and immobilization in a splint. J Bone Joint Surg Am. 1991 Feb;73(2):219–22. ^ a b Weiss AP, Akelman E, Tabatabai M. Treatment of de Quervain's disease. J Hand Surg [Am] 1994 Jul;19(4):595–8. ^ Lane LB, Boretz RS, Stuchin SA. Treatment of de Quervain's disease:role of conservative management. J Hand Surg [Br] 2001 Jun;26(3):258–60.